My grandmother, Mewe, died twenty-three years ago and was buried in her home village of Obubu, in Udu Local Government Area. In Urhobo tradition, their daughters are not buried with their husbands, in their husbands’ hometown, as is customary in many other Nigerian communities. Their families return their bodies to their home village. A structure, or dwelling, is constructed over the grave. Mewe’s funeral was an elaborate two-day celebration. I was only eight at the time of that funeral, but it remains vivid in my memory. So many people came, and there was so much food and drink, plenty of music (much of it live), and I remember the exhaustion in the faces of my parents and my aunts and uncles. They had made all the arrangements, welcomed hundreds of visitors, and kept energetic wake through the night in Obubu. I have just returned from Obubu to bury Mewe’s sister, Mama Beokuta. She was over ninety years old when she died. Her children originally gave her a Christian funeral, even though it was not her wish; she was not a Christian. She wanted to be buried as Mewe was buried, in the traditional way. We returned to Obubu because we learned that we did not in fact bury Beokuta; we had buried the wrong woman. My uncles: Areriobor, Friday, and Newman believe her spirit resisted the Christian funeral by evading identification at the morgue. Apparently another woman named Victoria (Beokuta’s English name), a fair woman with the same birth date as Beokuta, who was also toothless (as was Beokuta), was being kept at the same morgue. Sometimes when the morgue is overcrowded, they rotate storing the bodies in the freezers. Beokuta may not have been in the freezer when Uncle Friday and Cousin Minene went to identify her. In fact, they didn’t really see her at all. When they presented “Victoria,” my uncles and cousin did not recognize their mother; but the birth date was the same, and she was toothless…so, they carried her buried away to bury her. When Victoria’s real family came for their mother, they couldn’t find her. Uncle Friday got the call a few days after the funeral. We had to go to Obubu and return Victoria to her family and bury our own Beokuta. The women argue over how things should be done. Since I wasn’t able to attend the Christian funeral, I came along with Uncle Newman and Sissy Mary (my father’s oldest sister) to bury Beokuta in Obubu. I had not been to the village since Mewe’s funeral. 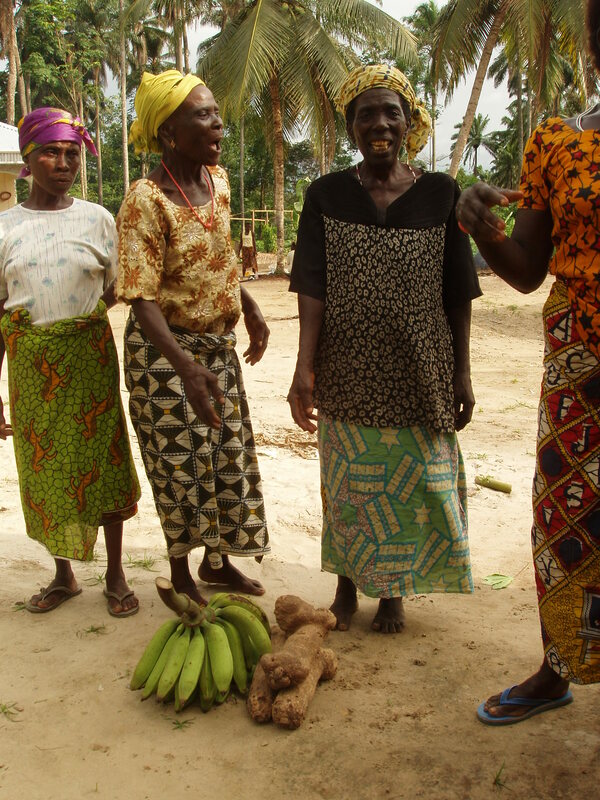 Obubu is a small, quiet village and its inhabitants are petite, small-framed people. The women, however, are strong and vocal; they were the ones who came out to greet us and to help us with the burial arrangements. I watched as they prepared the food under a cluster of palm trees just outside Beokuta’s resting place. The children trekked back and forth between the cooking site and the well, carrying large, heavy pails on their heads. When anyone was not immediately at work, they danced to the DJ’s music, which syncopated everyone’s rhythm as we got ready for the funeral: from the smallest of the children to the oldest of the women. The DJ had set up a small canopy with raffia leaves and thick bamboo trunks. Throughout the afternoon, the skies threatened rain as we prepared. I watched and listened, the raspy, rolling sounds of Urhobo floating around me; spice and root smells, mingled with subtle human odor and schnapps, occasionally tickling my nose. I felt at home. Beokuta’s burial place is just beyond Mewe’s. As I walked past Mewe’s resting place, I was struck first by how far it had deteriorated over the years. The windows and door had long since fallen away, and the walls had not been painted in all these years. Brother Mail performed a quick remembrance ceremony in her resting place, with an offering of rice, kola nut, and libations. Uncle Newman later took us into Mewe’s room to communicate with her. It felt surreal standing over my grandmother, in an empty room and gin splashed on damp cement floor in libation. Keeping wake…dancing through the night. Back outside, I gratefully breathed in the fresh air. As night drew near, we began to perform the burial rites for Beokuta. The elderly men began by going out to the edge of the village to welcome Beokuta’s spirit. They call her to come and rest. This is done by setting up a kind of welcoming post, with two lanterns on each side of the path leading to the burial compound. Some rites are performed there to ensure she comes through. Later on, in the night, three fires are set. This is part of the process of settling her to rest. The music plays in the background, and people began to eat and drink. We, her kinsfolk, kept wake throughout the night, as the other rites were performed. A goat was sacrificed to “feed the ground.” The blood of the goat is distributed over her grave. Other offerings are made such as yam and plantain, along with dried fish in fulfillment of the homecoming. I did not witness how or when these offerings were made, however. As we kept wake, we were called three times to dance round the fires, as the men sang out to Beokuta and our other ancestors. 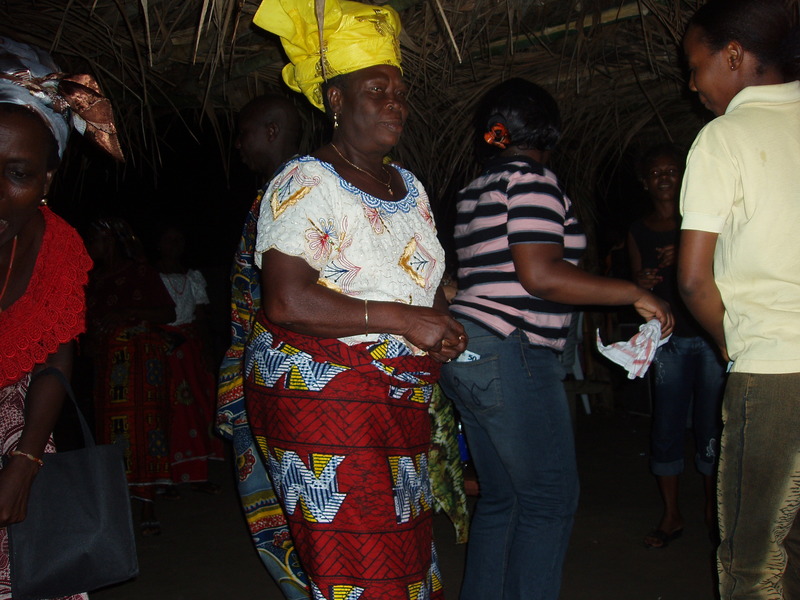 The DJ then took over, and we danced and ate throughout the night, keeping ourselves awake in order to keep company with Mama Beokuta. Groggy and fatigued, we greeted the morning with the final rites. We implored Beokuta to enter her resting place finally. The elder men then led a small procession through the village, a short call and response to accompany our steps. We were announcing Beokuta’s life and death, offering a sip of Ogogoro (a local clear liquor) to bystanders along the way. This concluded the long ceremony. We went round to embrace each other. I breathed in deeply the earthy odors of my kin, trying to create a sensory memento of this experience to keep with me and remember. My life is so far away from this small place, but a piece of it is in me. It is because of this place, these people that I exist. It’s been a lovely couple of weeks, having a routine, some much-needed solitude, and finally getting some good research done. The intense amount of traveling I’ve done over the past several months has really taken its toll on me, and Ruth’s house has been a Godsend. I’ve been hanging out with the other Fellowship scholars, and have gotten particularly close to Helen. * She’s a writer of both fiction and non-fiction, mostly short stories. I like her wit. She’s down-to-earth and has a sophisticated sense of humor. After a long day of staring at documents, it’s nice to unwind with a cold beer and some fresh Suya or Akara. I try to put in a minimum of five hours at the archives each day, but find that my resolve doesn’t last much beyond four hours. Inconsistent electricity, inadequate lighting, and a fair amount of dust floating around in the air really work to slow me down. Mr. Abraham, a senior staff member here, has been a savior. He checks in on me, making sure I get my documents as quickly as possible. Unfortunately, not all the documents I request actually surface. They are somehow lost in the system, and even though Mr. Abraham puts in a search for them, I don’t have much hope that they will resurface. 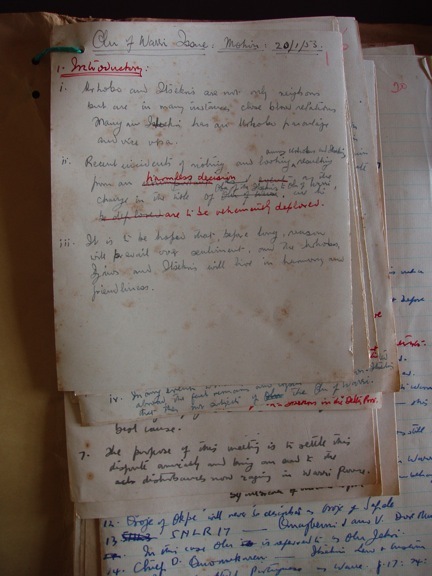 Some of these are really juicy files too: mostly on grievances lodged against the colonial government by local communities. (I know: I’m a nerd…) I have a clue about how files might easily go missing. Frequently the junior staff are not present in the reading room, leaving the users in the room alone with the documents. I could easily walk out with a file without anyone noticing. There is a television in the reading room (yes) and it is always on (at low volume, of course, but audible none-the-less), and the staff often station themselves in front of it, their backs turned on the readers, to pass the time away. Some mornings, I arrive a bit too early, say, 9 a.m., and I sit out with some of the staff at the entrance to the Archives. I’ve learned that they haven’t received a paycheck since the end of last year. It is clear: morale is low, to say the least. Over time, hovering over documents to snap digital photos can take its toll on one’s back. This, along with the lighting difficulties, makes for a tricky choreography. I’m sure I look comical to the staff, shifting this way and that, sometimes standing on tip-toe to get a good, unobstructed, well-lit shot of the documents. The files often come to me in unruly, jumbled, yet fragile compilations. I am often afraid to handle some of the documents because they are on the verge of disintegrating completely. 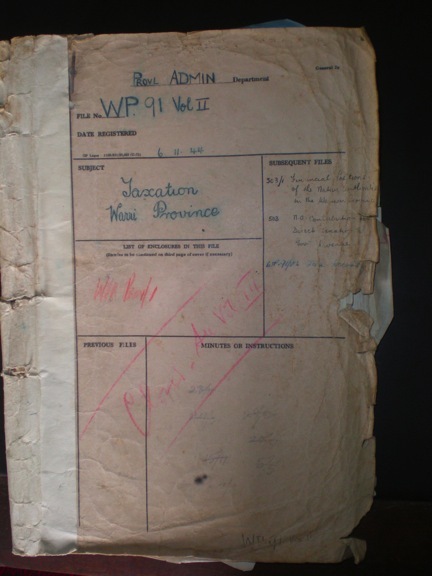 These are twentieth century documents. They are not old. And, as I slowly make my way through these files, I observe other users casually, roughly handling similar documents at their tables. Because the staff have not been properly trained, there is no one to advise users on proper handling of the documents. The lack of a controlled environment, along with a lack of institutional support or value is quickly destroying this archive. Everyday, I watch fragments of paper flake onto the tabletops and to the floor without notice. I feel helpless. I wish I could have begun this work earlier…had not wasted so much time in Benin. But how could I have known that Benin was not the place to start? I try not to panic at the thought that I have yet to begin conducting interviews in the Delta. And I am so far away, here in Ibadan, sifting through documents. Then there is the consistent, nagging doubt that the documents I am going through are the right ones. I constantly question whether I am recording enough information, or selecting the right files. Then there is the awful thought that I may not get enough, that I won’t finish…and then…finally…what if I don’t finish this dissertation? The downward spiral of negative thoughts circle round the stale, fuzzy words on the pages in front of me, and I have to catch my breath; call myself back to the task at hand. I return to Benin in a couple of days. I have to get back before elections begin. The Archives will close due to the Easter Holiday. They shut down for a Muslim holiday last week and on Monday this week there was another civil servant’s holiday. Early last week, the staff arbitrarily announced, at around noon, that they were going to close the Archives at 1:00 that day. There was no forewarning, no explanation. Come to think of it, the routine I had mentioned earlier really isn’t much of a routine. I just have it in my head that I am on a campus, and that my daily focus is to get as much information from this place as I can. I dread the upcoming elections. I should have begun my interviews this month, but everyone I’ve spoken to, who are helping me arrange them, have asked me to be patient until elections have passed. I have also been advised to return home, to Benin; it is safer to be in a familiar environment, close to family, than far away in an unfamiliar place. This means two weeks of no work. My mouth gets dry just thinking about it.